The oldest reference to swing in print was a dance from San Francisco called the Texas Tommy Swing in 1910. As the 1900’s moved on, each major city created its own version of swing. One of the most influential styles of swing, know as the Linde Hop born in Harlem in 1927 combined elements of jazz, tap, blues, breakaway and Charleston. As American pop music changed, so did the swing. World War II swing music helped shape what we now know as the world competitive style called Jive. Slow blues and cool jazz music gave form to the slower dance, the West Coast Swing. 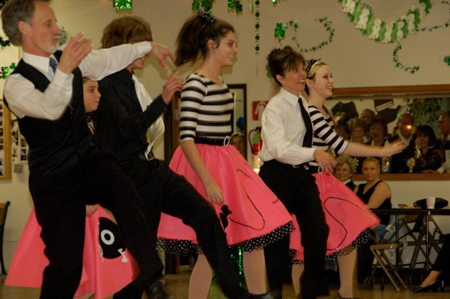 Whether you call it Texas Tommy, the Collegiate, Linde Hop, Shag, Balboa, Jitterbug, East Coast Swing, Western Swing, Boogie Woogie, Rock ‘n Roll, Texas Push, West Coast Swing – it’s all swing and it is still popular today and is still evolving.